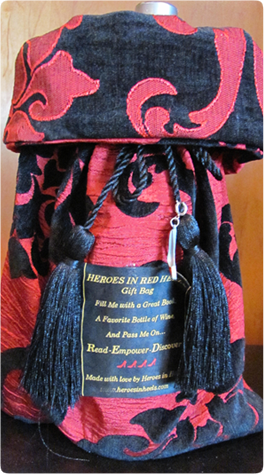 Introducing our New, Heroes in RED Heels Gift Bag! 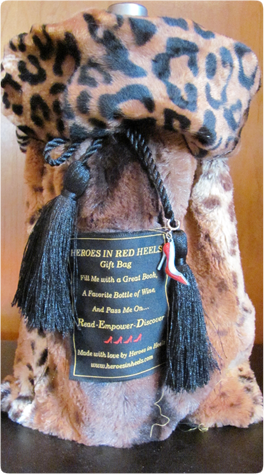 Fill this beautiful and unique” traveling” Wine and Book Bag with a copy of our Heroes in Heels Book (or another special book you love) and a favorite bottle of wine… and give it to that special Hero in Heels in your life! Each bag will continue to be refilled and passed on to someone else, as instructed on the label of the bag. The perfect and distinctive gift to share with all the favorite women in your life, for a birthday, Christmas, Mother’s Day, book club meeting, wine tasting event, Holiday Party, a challenging time, to say thank you, a new mom, a new bride, or simply just to let a gal pal know you love her! Each custom bag is individually numbered on the attached product tag. Every recipient of the bag will be able to track the bag (see the link to “track your bag” on this site) so you can see who has received it, where it has been, what books have been shared in it, and what fun wines (or beverage) have been enjoyed! 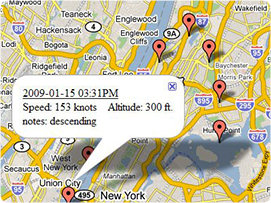 Don’t forget to check out the map that shows where all the bags are currently located. 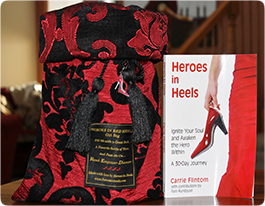 In true Heroes in Heels fashion, each bag is made by women in America, and a percentage of the proceeds from each bag will be donated to help support the Women’s Literacy Project. Share your touching stories, track the bags as they travel, support women’s literacy and women in the work-force while encouraging others to touch the lives of the special Heroes that have crossed their paths.